Digitrax Tool Box V2 now available for iPhone / iPad and Android! Decoder Selector - Find recommended decoders for specific locomotives and find a locomotive for any Digitrax decoder. News & Events – Keep up with the latest from Digitrax in the palm of your hand. Dealer Locator – Find your nearest dealer anywhere in the world! With maps and contact information. 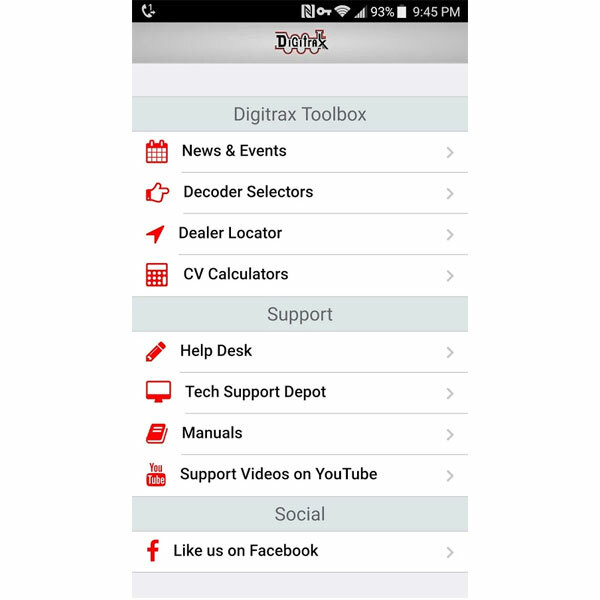 Manuals – View Digitrax Manuals & Instruction Sheets anytime, anywhere! CV Calculators: Compute the CV Values for 4-digit addresses, decoder configuration, lighting controls, advanced consist control and more. There’s even a hex/dec calculator for customers with legacy throttles. Tech Support Depot: Find help fast with our comprehensive support documentation. Help Desk: Have a problem with a Digitrax product? Easily get in touch with our tech support and repair staff! Video Tutorials – Get the help you need with YouTube video tutorials on the go! Version 2.0 of the Digitrax Tool Box has been released! Help Desk, Tech Support Depot, and Support Videos for YouTube added. iOS devices: iOS 9 / iPhone 4s & iPad 2. This is due to Apple's 64-bit requirement on the app store. Download Now for iPhone/iPad or Android!